Two teams of astronomers announced the discovery of APM 08279+5255, a quasar 12 billion light years away that holds at least 140 trillion times the amount of water in all the Earth's oceans combined. This quasar holds a black hole that's 20 billion times more massive than the sun, and after gobbling down dust and gas it belches out as much energy as a thousand trillion suns. The water vapor is spread around the black hole in a gaseous region spanning hundreds of light years. "The environment around this quasar is unique in that it's producing this huge mass of water," says Matt Bradford from NASA's Jet Propulsion Laboratory. "It's another demonstration that water is pervasive throughout the universe, even at the very earliest times," adds Bradford. 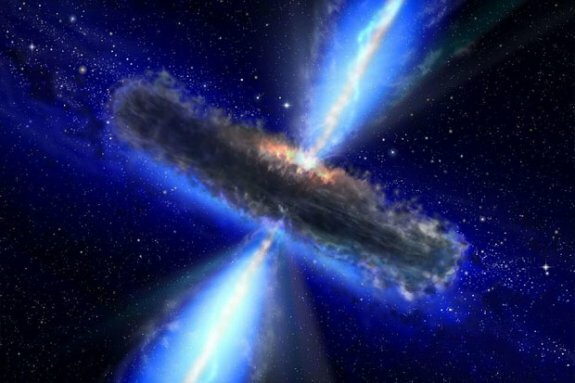 As the light from this watery quasar took 12 billion years to reach Earth, the observations come from a time when the universe was only 1.6 billion years old.